In life, User was the vizier to Queen Hatshepsut, Egypt’s longest-reigning queen. He was a man with great power and great responsibility, a trusted adviser to the Pharaoh herself. That earned him a place of honor in death, including burial in an ornate tomb located near Karnak Temple in Luxor, Egypt’s famous valley of monuments. Finding an ancient tomb is nothing new in Egypt, where there are tombs all over the place. However, what is interesting is that, found in the tomb, is the door to the afterlife. 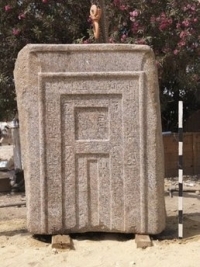 It’s a piece of red granite, 1.75 meters (about 5 feet 7 inches) tall and .5 meters (19 inches) thick. Covering the granite are various religious notations, as well as User’s various titles (including mayor, prince, and vizier). The granite was later re-used as part of a wall in a Roman-era home before being rediscovered by a team of researchers. Here’s a question to ponder: how did the Romans use it? Was it decorative? Was it just a piece of the wall that looked cool? Was it a false door (as it was in User’s tomb)? I’d imagine a giant slab of granite would come in pretty handy when building an addition onto your home, no matter how you ended up using it.